The 2017 MMCRU Middle School Football team finished strong. After a few bumps in the road early, the Royals smoothed things out. The Royals lost the first game of the season to a good Gehlen Catholic team 28-0. The second loss was to Hartley-Melvin-Sanborn 26-6. Then the Royals turned things around. They beat Alta-Aurelia 30-22, Unity Christian 28-6, Akron-Westfield 16-0, and Maple Valley-Anthon-Oto 40-0. The seventh grade B team finished the season 4-1-1. There is definitely a bright light at the end of the tunnel for the MMCRU Royals. 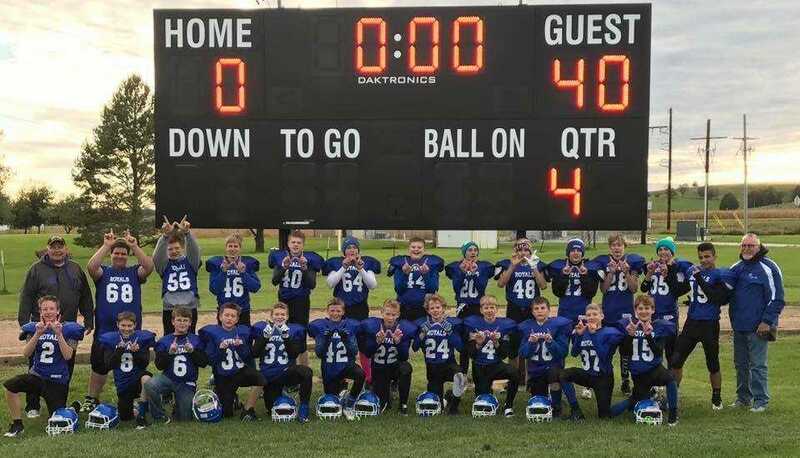 MMCRU Middle School Football Team members, include, Front row, from left: Austin Paradise, Carson Loutsch, Trace Agnitch, Josh Armfield, Andrew Barinsky, Derek Goth, Carson Pick, Gunnar Johnson, Owen Alesch, Bryce Tentinger, Colin Pick, and Brenin Stodden. Back row, from left: Coach Mike West, Damien Van Iperen, Michael Rupp, Josh Wetter, Brett Staab, Carter Jenness, Matthew Kollbaum, Keegan Stevens, Jason Kirchner, KC Nicks, Kamden Steffen, Preston Astidias, Eban Hicks, and Coach Rockie Bork.